As a rule I believe that the more effort you are willing to put into the hike or climb, the more rewarding the views will be. But as with every rule, there is always an exception. 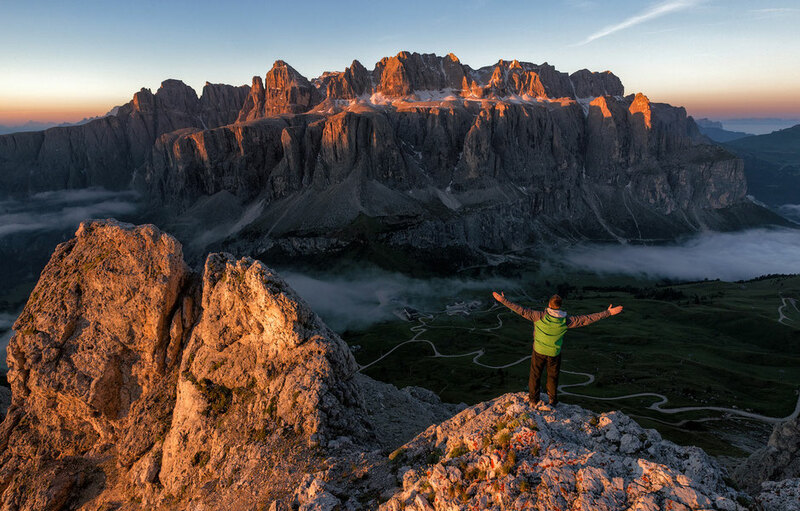 In the via ferrata World of the Italian Dolomites, it doesn't get easier than Gran Cir. But easy doesn't mean it won't be worth it! On the contrary the views from the top will stick with you for a long long time. 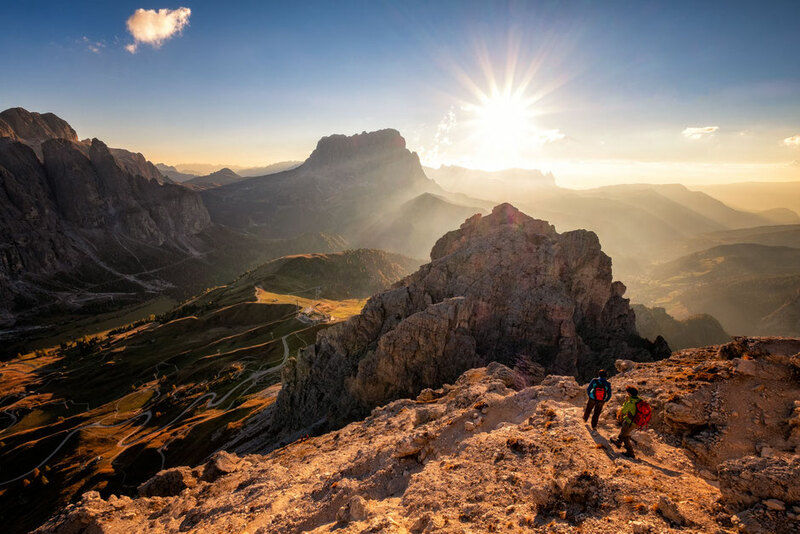 Gardena mountain pass, where the via ferrata Gran Cir begins, connects two famous valleys in the Dolomites: Val Badia and Val Gardena. 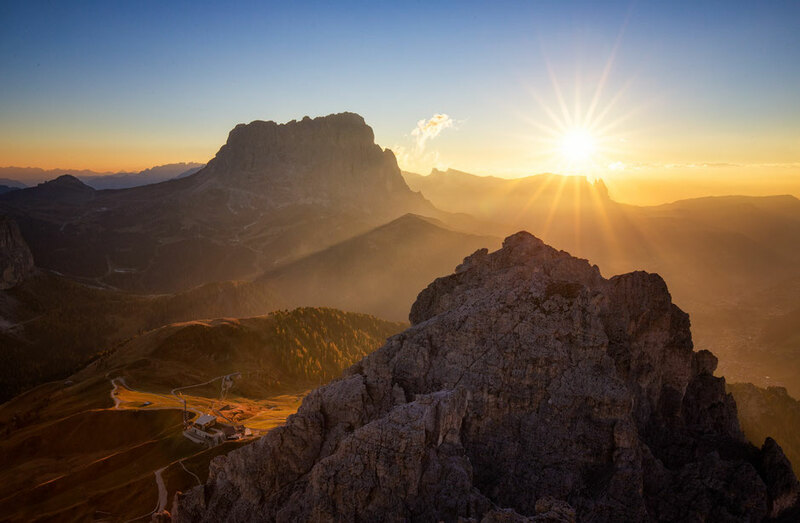 The nearest towns to Passo Gardena is Corvara in Val Badia and Selva di Val Gardena. Each one lies only 20 minutes away by car. 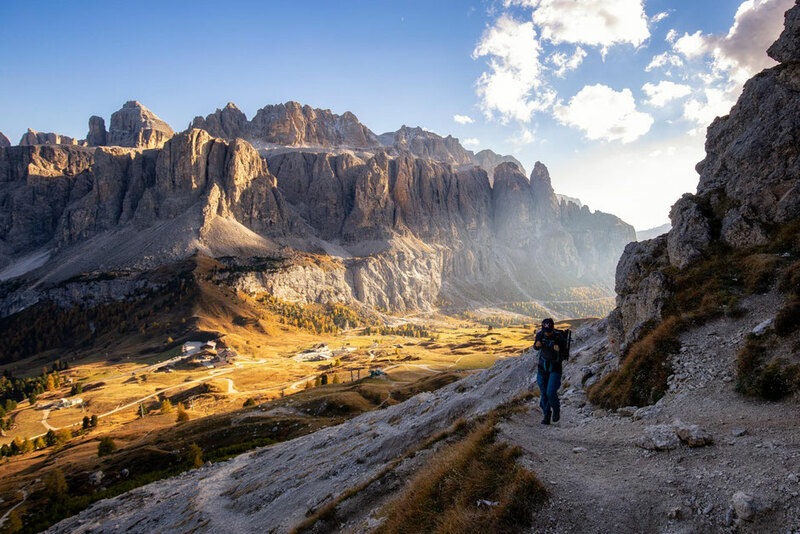 There is an ample parking area right near rifugio Frara, near the top of the pass, but it does fill up quickly in the peak season (July and August) and on the weekends. The earlier you get there the better. In the summer season there are public buses running a few times a day between both towns and Passo Gardena. If you are planning to use the public transport I recommend visiting the nearest tourist info centre to find out the schedule as it changes seasonally. Passo Gardena veiled by morning fog. 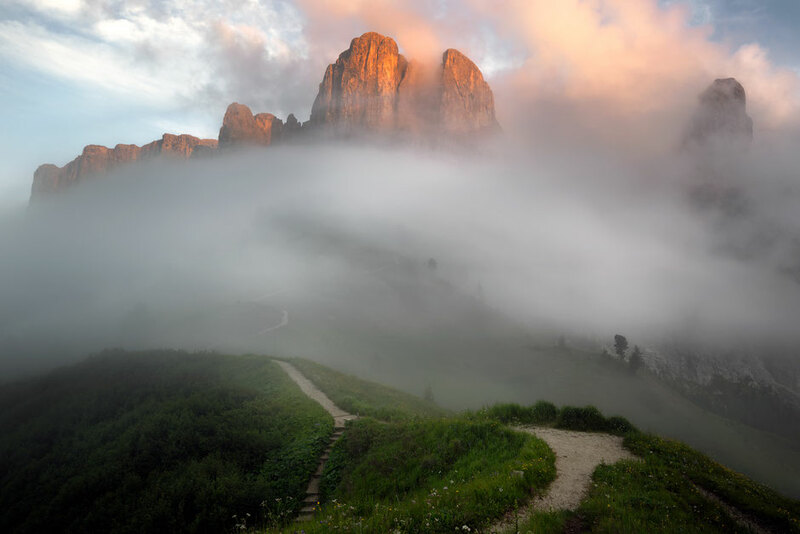 Sella group peaking out from the cloud. Hiking up the scree gully with Sella group behind me. The top of Gran Cir is clearly visible from Passo Gardena. If you squint your eyes you can even see the cross on top of it. To reach it from the parking lot you have to first follow path nr 2. Eventually you will come across signs pointing to Gran Cir. As per usual, the routes in the Dolomites are always very well marked and as long as you stick to the path, it's impossible to get lost. After around 15 minutes of gentle incline you will reach a scree gully. Follow the path up the left side of the gully until you reach the cables. They will be on your right hand side. The wire section on this route is very short. The exposure isn't too bad and I have seen plenty of people not even wearing harnesses and helmets. However I am a strong believer that it's always better to be safe than sorry. I have already experienced a terrible accident in the mountains once and I am in no rush to repeat it. The route zig zags up the mountain. Thanks to a relatively sharp incline you will gain elevation quickly. 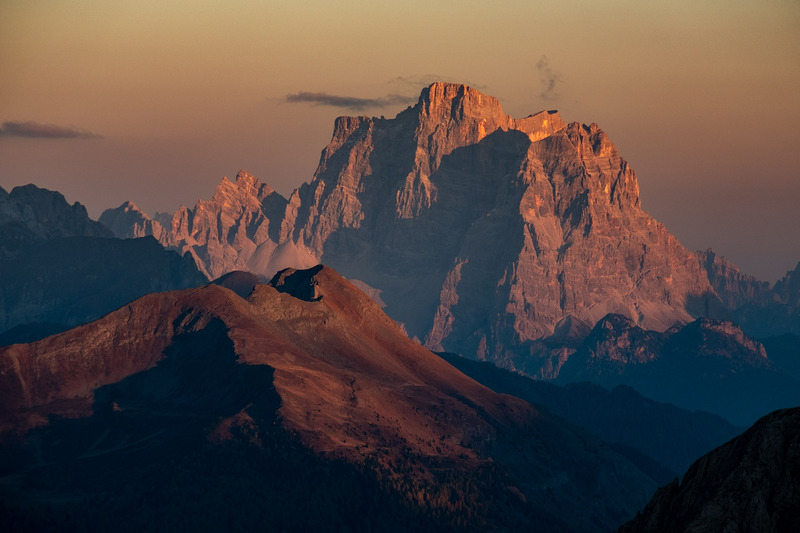 The jagged peaks of the Sella mountain group on the other side of Passo Gardena will be clearly visible the whole time. It only takes around 45 minutes from the gully all the way to the top, even less if you are in the top shape! 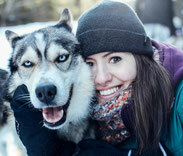 Once at the summit, expect other hikers. This is a popular sunrise and sunset spot amongst the locals. 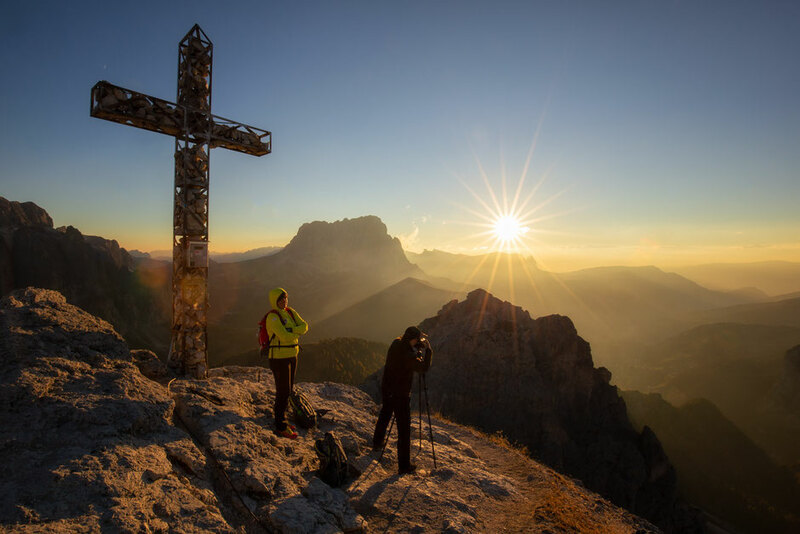 The giant cross adorning the summit is a good reminder of the strong presence of the Catholic church in the Italian society. They are on every bloody summit! I always think that their role is to remind you, that if you are not careful, you will meet Jesus sooner than expected. The summit views are jaw dropping. Far to the East you can see Mount Antelao (photo top left) and Mount Pelmo (photo top right). 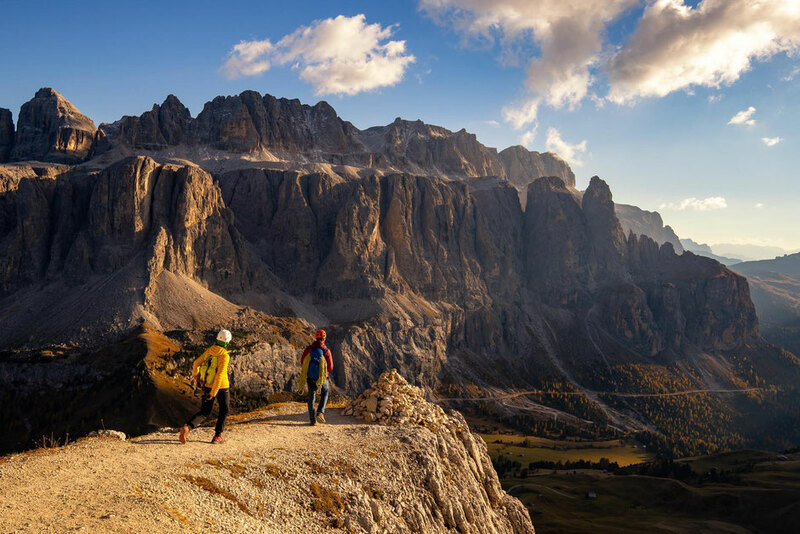 Both are famous 3000 metre peaks of the Dolomites. 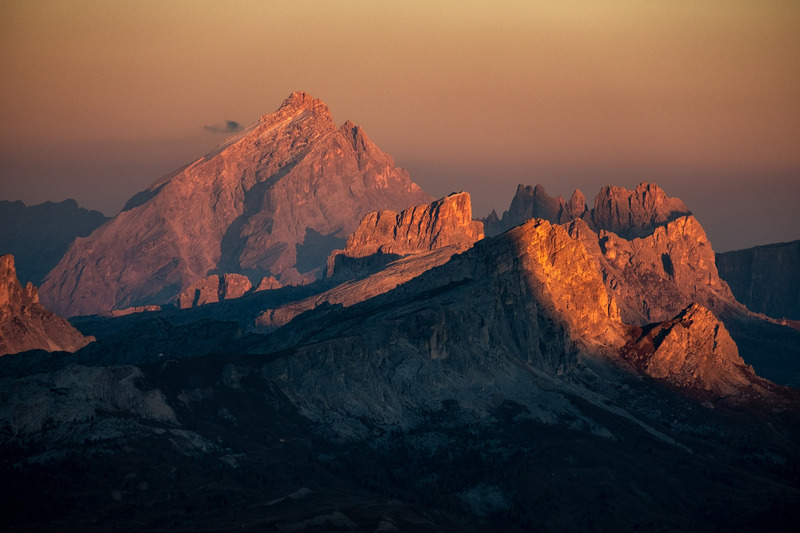 To the South stretches the massive Sella group with its highest summit - Piz Boe. I am planing to climb it in the upcoming summer. 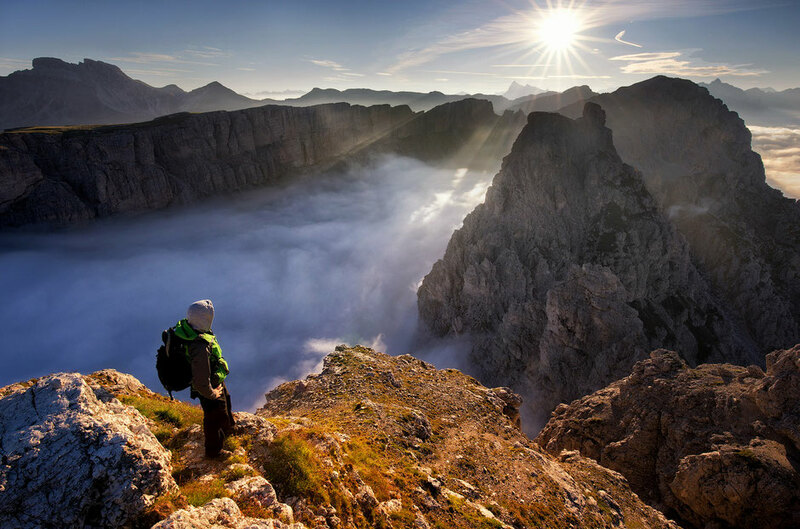 West is the famous Sassolungo, a beloved subject for photographers. Through the middle of it runs another popular via ferrata - Oskar Schuster. Enjoying the sunrise over the clouds from the summit of Gran Cir. Sella group in the distance. To descent from the summit just follow the same route. The way down is usually faster and within an hour you should be back at Passo gardena. Make sure to pop into rifugio Frara for a tasty cup of Italian cappuccino and an apple strudel! You've earned it! Do you have any questions about this via ferrata? Post them in the comments below and I will be happy to answer!